Bolingbrook’s Clow UFO base was shutdown for 12 hours after customs officers discovered a brown paste leaking from a UFO. After detaining the crew, the captain of the craft claimed the paste was ectoplasm, a substance from the afterlife that helps spirits materialize in our world. Following the threat, the Black Team, consisting of aliens and members of Bolingbrook’s Paranormal Affairs Division, started their investigation. The Black Team performed a “special calibration” on their detection equipment from over 25 different civilizations. The results stunned the team. “Our reading were all over the place!” Said Williams. “On an infrared sensor, a team member would stand in place for several minutes. When the member walked away, a ghost would appear in the same spot, in almost the same configuration! I still say it was weird. The team then advised Mayor Roger Claar that Clow needed to remain closed until the “netherworld” visitors were removed. That would require three weeks, and the combined services of priests, pagans, psychics, and ghost hunters. According to sources, Claar scoffed at the idea of closing Clow for three weeks. Instead, announced that he would seek a second opinion. 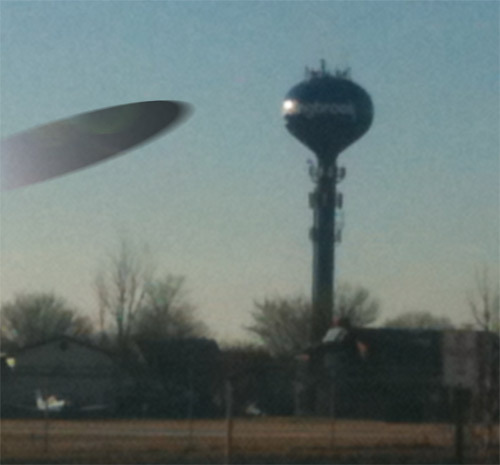 Claar then ordered a UFO crew to bring Joe Nickell to Clow. Fifteen minutes later, Nickell walked into the room, still shaving. After accepting Nickell’s apology, Claar and the team explained the situation to him. “What makes you think the spacecraft is haunted?” Asked Nickell. “We got some weird reading from our equipment.” Said Williams. Thirty minutes later, Dr. Rachael Dunlop, wearing a virtual reality helmet, was escorted into an isolation chamber where Nickell was waiting. After sealing the chamber, Nickell removed the helmet from Dunlop. Dunlop, after overcoming her disorientation, demanded to know where she was. “Clow? Richard warned me about this place. You don’t need me to stand under a spacecraft, do you? Dunlop then sat down at a table that had two hamburgers from Charlie’s Restaurant, and a jar of the alleged ectoplasm. Without hesitation, Dunlop opened the jar and spread the brown paste on the bun. Dunlop then explained that after President George W. Bush banned the importation of Vegemite, some desperate US citizens tried to make their own version using yeast extracts from American breweries. “It should be illegal to make this fake Vegemite!” Said Dunlop. After suffering no ill effects, both skeptics were released from the isolation chamber. The aliens, after undergoing “enhanced interrogation,” confessed that were smuggling American Vegemite off-world and were going to try to pass it off as Australian Vegemite. Because the Australian government strictly limits the interstellar export of Vegemite, it is more precocious than gold on some worlds. In addition being a food source, some civilizations use Vegemite as an industrial sealant, glue, makeup, blood substitute, and fertilizer. Its use in torture is banned on over 500 worlds. After Clow reopened, several aliens and staff members asked to have their pictures taken with Dunlop and Nickell. “Nickell taught me to really investigate a mystery, not just point a machine at it.” Said Williams. When this reporter tried to reach Dunlop, Skeptic Zone regular Maynard answered the phone. He explained that Dunlop and Saunders were out doing a Mystery Investigators’ show. Maynard also denied that Vegemite is banned in the United States. Vets: Protect your pets from werefleas!